To Sum It Up: As a Soulfinder, Yelena’s powers are stronger than those of most magicians, much to the concern of Sitian leadership. Sitia is on the brink of war with Ixia, and Yelena’s loyalties are caught in the middle. She’s also up against one of the most intimidating foes she’s ever faced, and not even Yelena’s magic may be able to stop the Fire Warper. Review: We have arrived at the end of the original Study trilogy, and I’m feeling rather conflicted. 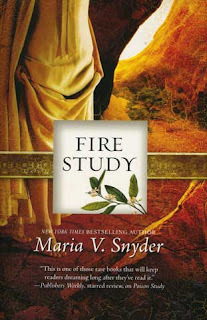 It’s not as though I wasn’t expecting the things that still, after a reread, didn’t quite work for me about Fire Study. I mean, I still love the series, but a lot of that love stems from how amazing the first book, Poison Study, was and my attachment to some of the characters, including the equine ones (love you, Kiki!). I also just have really warm, fuzzy memories of reading all three books way back in my pre-blogging days, and sometimes it’s tough to turn a critical eye toward this series. I will say that neither Magic Study nor Fire Study surpasses the superb Poison Study, and I think Fire Study lags behind the most, especially in terms of pacing. Magic Study seemed a little long to me; Fire Study definitely felt too long. Yelena makes several pit stops as she criss-crosses her way through Sitia, Ixia, and Sitia again in her quest to save Sitia and Ixia and everybody and everyone. Yelena takes it upon herself to do all of the rescuing in this one, which, being one person against a slew of evil Daviian Vermin, Warpers, and one extremely troublesome Fire Warper, leads to a host of headaches for our heroine. It’s unnecessary trouble at times. Yelena has dedicated allies who are more than willing and capable of lending a hand, but her determination to protect them means she gets into a couple of avoidable scrapes that don’t really add much to the story. Don’t get me wrong, I love Yelena and how far her character has come since we first met her, but some of her decisions and actions here are frustrating. Once again, Valek is absent for a good deal of the book, and again, it’s not an easy absence to ignore. Yes, I love Valek, but I don’t miss him for purely selfish reasons alone. His presence demands your attention, and when he’s not there, the books simply aren’t the same. I savored every scene he was in, as well as every page that featured the spin-off-worthy duo of Ari and Janco. Yelena’s brother, Leif, lightens up considerably in Fire Study, making him considerably more pleasant than the dour Leif of Magic Study. The siblings banter often with each other, which is very welcome amidst the perilous situations they frequently find themselves encountering in Fire Study. The action in the first two-thirds of the book isn’t as exciting as what happens in the last third, when it all gets real. I thoroughly enjoyed this part of the novel and how the sequence of events unfolded, and it reminded me why I fell in love with the series in the first place. While I had some issues with Fire Study, its strong finish closed out the trilogy in a very satisfying manner. All in All: Your feelings toward Fire Study will likely depend on your overall investment in the series. By the time I read this, I was madly in love with the books (and Valek, of course) and admittedly viewed this novel with a more subjective eye than usual. Although Poison Study is easily my favorite book out of the three, staying with this series was absolutely worthwhile for me, as was reading the Glass spin-off series. Yelena and Valek have so firmly taken hold of my heart that obviously I’ll be following their continued adventures in their brand new series of novels. I'll have you know that I started Shadow Study today. I'm floating so far, Snyder gives brief backgrounds to the people and the situation. But knowing that the characters started in this series is howevering in the back of my head. I'm excited to see what you think of Shadow Study! It had to be a bit challenging for Snyder to balance giving enough backstory for readers new to the characters and the world without overdoing it for others who've read her previous books. I felt that I should've reread her Glass spin-off series because some of those peeps turned up in Shadow Study and I had to dig deep into my aging brain to remember who they were, lol.